Dog trainers love drawing lines in the sand: positive reinforcement, force-free, balanced, old-school. As much as we hate labeling dogs, many dog trainers seem to love to label other dog trainers. I’m not immune to this trend. As I created my website, write my blogs, and interact with the world, I use various shorthand descriptions of my training philosophy. This is mostly laziness on my part. I don’t always want to spend a long time explaining how I train dogs, and my audience generally doesn’t care much. Like many other trainers, I really struggle with these labels. I don’t only use positive reinforcement in training, nor am I always 100% force-free in my interactions with my dog. If Barley has a tick, I’ll force him to hold still so I can remove it. If Barley is eyeing another dog’s tennis ball, I’ll tell him no. So neither “force free” or “positive reinforcement” really works as a label for me. I guess I’d have to say that I focus on being as positive and motivational as possible while adhering to the Humane Hierarchy, but I’m sure there’s a problem with this sentence somehow. Currently, I’m not too hung up on this fact. More and more, I’m subscribing to the concept of “shut up and show off,” where I’ll explain my training methods if someone asks about them. Mostly, when I’m out and about, I just quietly model how I train my dog and interact with my clients rather than evangelizing. However, I want to add my voice to the growing number of trainers who are pointing out that divisions in dog training aren’t always as stark as we think they are. Even though I almost exclusively use mark-and-reward training paired with antecedent arrangement in training, I still say no to my dog. I adhere to the Humane Hierarchy as much as I can, but life is not always a training session. The reality is, I can set up my training sessions in a way that I almost never correct dogs in training sessions. But life isn’t a training session. If Barley is about to do something that’s inconvenient, dangerous, or irritating, I will often give a small verbal correction or stop him with the leash. Does Barley like this? Of course not! He’d love to play tug with my socks, eat food off the counters, pull at top speed on walks, roll in the mud, and swim in swamps. Immediately after correcting Barley, I give him something else to do instead. I may yell at him to stop him from chasing a cat, but then I pull out my treats, his zen mat, and ask him to lie down and stay. If I don’t have treats or toys with me (which is rare), I’ll just ask Barley to touch my hand with his nose to redirect his attention. This generally works. The key is that after I correct Barley in life, I make an effort to go back and set up a training session so that he knows what to do next time. If I have to yell “NO!” at him to stop him from running away to roll in the mud, next time I’ll practice relaxation and loose leash walking near a tempting wallowing hole. 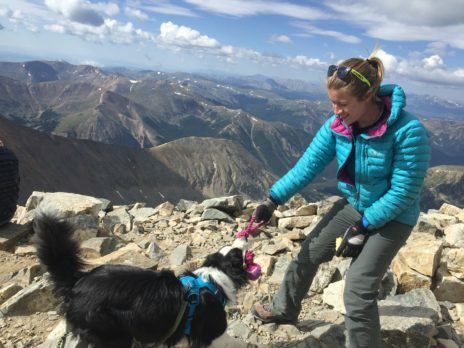 If you’re interested in learning more about training techniques mentioned in this article, be sure to book a call with me – I’ll help you implement these techniques in your home to create a better-behaved dog! This is not to say that I spend all day telling Barley “No!” In fact, I do my best to avoid correcting him. I control the environment so that he’s less tempted to misbehave. That’s step one, the bare basics. 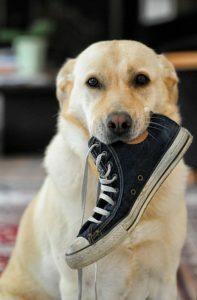 If dog owners spent more energy on preventing their dogs from misbehaving and less time correcting their dogs, dogs would be much better behaved. Aside from controlling your dog’s environment and training your dog for good behavior in tricky situations, your next step is to try the SMART x 50 training technique. SMART x 50 stands for See, Mark And Reward Training. Your goal is to notice 50 small “good deeds” in your dog every single day. This training works by rewarding your dog for small good behaviors all day. Your dog learns that sitting, lying down, and ignoring temptations gets him treats. He’ll start to misbehave less because behaving well gives him rewards. 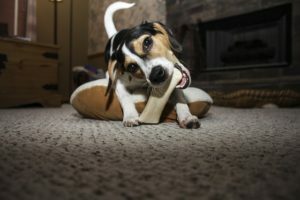 If you’re interested in learning more about SMART x 50 and other training techniques mentioned in this article, be sure to book a call with me – I’ll help you implement these techniques in your home to create a better-behaved dog! Start with 50. Rather than constantly correcting your dog, count out 50 treats or pieces of kibble. Remove it from your dog’s daily ration if you’re counting canine calories. Put it in a bag or jar that’s easily accessible from anywhere in your home. Don’t forget to bring it during walks. See. Whenever you’re around your dog for the course of the day, pay closer attention to your dog. Notice any small “good deeds” that your dog performs. This might mean lying down while you watch TV, sitting outside the kitchen while you cook, or looking up at you on your walk. Don’t forget that you can also reward your dog for continuing a behavior. I generally focus on rewarding my dog repeatedly for lying down while I do other things around the house. He doesn’t have to get up and lie down over and over. I just keep rewarding him as long as he keeps lying down. This has helped me create a calm, relaxed border collie in my home. Each time your dog performs a small “good deed,” mark the behavior with a word. I generally say “good boy,” though you can say whatever you like! And Reward! Right after you say “good boy,” walk to your treat stash and reward your dog. This is also the Training part of the sequence. In summary, dog trainers like to label training styles. Many trainers use mark and reward training in training sessions will use verbal corrections with their dogs “in real life.” The key is to minimize punishment and reduce the severity of punishment. Then, set your dog up for success. What separates great trainers from the rest is what they do after they say no to their dogs. 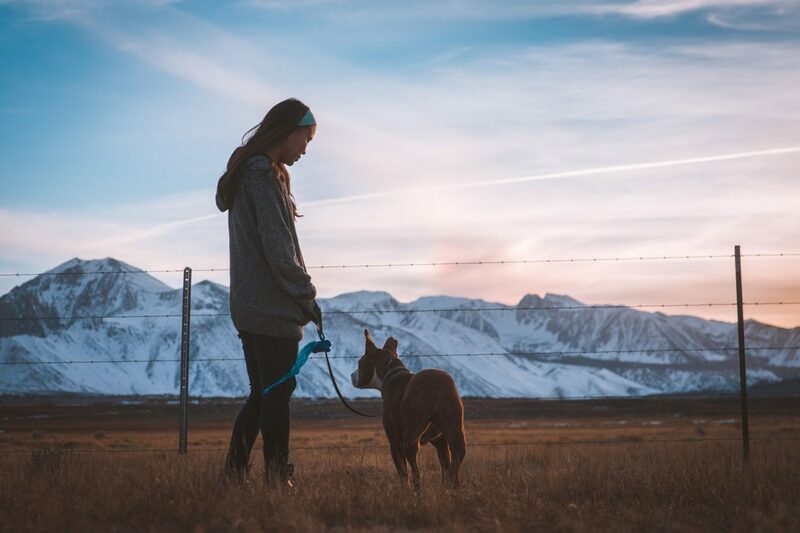 Great trainers and owners will set up training situations to practice skills, control the environment to reduce temptation, and practice SMART x 50 to help teach dogs how to behave in all situations. It’s ok to say no to your dog, as long as you’re consistent and fair. It’s what you do after you say no that counts.